Harvesting: Do you have any crops in your garden like tomatoes, zucchini, or beans? Fruits and vegetables should be ready for picking! When you harvest regularly, your plants will be encouraged to produce more food. Not only that, but pests will stay away if they have nothing to eat. Containers: Your containers may be attractive vessels for your plants, but just like any home décor, they need cleaning every now and then. Ridding your containers of spots like the white crust that results from salt buildup will keep your plants happy and healthy. Houseplants: Unlike outdoor plants that are growing in the ground, houseplants are convenient because you can transport them easily when the summer sun makes some spots bad for greenery. If a houseplant is sitting in direct sunlight, think about moving it somewhere where the light is filtered or shaded so that your plants don’t scorch during the hottest months of the year. Annuals: Once your annuals have finished blooming, you can remove them so that you can make room for new varieties. Watering: There are several things you can do to improve your watering routine during these summer months when every drop counts. Liquid evaporates in the middle of the day when the sun is at its peak temperature so water your plants in the morning and the evening in order to quench their thirst. You know that your plant has been properly watered when the top 8”-12” of soil has been saturated with liquid. Once water starts leaking out of the soil, you know you can move onto the next plant. Container plants: Watering plants in the ground is important but container plants need even more attention during the summer. Daily watering may be necessary to keep container plants healthy as they grow and face July weather. Meanwhile, water will inevitably drain out of the bottom of containers with holes, so take care to use a water soluble fertilizer on these plants. Trees and shrubs: New trees and shrubs are wonderful but they get easily dehydrated during the summer. Two soakings weekly during the hotter months will help them grow strong. If you don’t already have them, you may want to invest in equipment like buckets, traditional hoses, soaker hoses, and sprinklers to keep canopies moist. 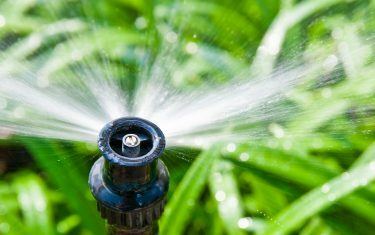 Sprinkler system: Sprinklers are a popular way of preventing dry yards. Like with anything, there are rules of thumb for using sprinklers most effectively. If any water is being wasted on pavement, adjust your sprinklers accordingly. Lawns need 1 ½” of water weekly during summer and a rain gauge can help you figure out how often to turn your sprinklers on. If it rains, sprinklers can turn off automatically if a rain sensor has been synced with your system. Pruning: If you have trees like birches or maples, consider pruning them in July. Trying to do so during the late winter results in bleeding so it’s best when this chore is taken care of now. Pests: If you’ve seen slugs sliming their way around your precious flowers, take some beer you’ve acquired for your summer festivities and put it in a shallow container. If you place the container and sharp objects like eggshells by your garden, you will solve your slug problem. Mosquitos may also be a distraction while you’re trying to enjoy your yard and the nice weather. Mosquitos love still water so rid your property of any through drainage or the installment of an attractive fountain. Fertilizer: Despite the fact that they can be so good for your yard, fertilizer can unfortunately burn your lawn in the summer. To prevent this from happening, refrain from using it until autumn, when the temperature starts dropping. Fall plants: It may still be summer, but it’s never too early to start considering what you might want to see in your garden come fall! If you want autumn plants or vegetables this year, give yourself time and start planning your fall garden now.